Hollywood, California (The Hollywood Times) 4/15/2019 – “I thank all of you for coming, TCM, Ben, Ted Turner, everybody involved in this. Because this really means a great deal to me and I don’t take this lightly at all. 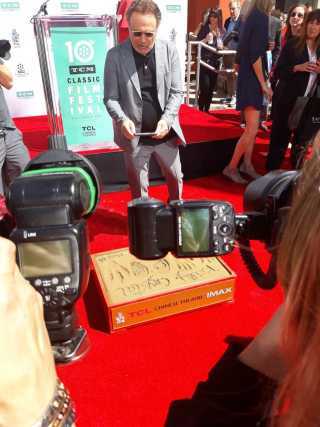 I take this to my heart, thank you.” Billy Crystal told the audience at his Hand & Footprint Ceremony on Friday, April 12, 2019 in the courtyard of TCL Chinese Theatre. Day Two started out with four movies starting at 9:00 a.m.: The Postman Always Rings Twice (1946); Merrily We Go To Hell (1932); The Clock (1945) and High Society (1956). The main event for the day was the Hand & Footprint Ceremony honoring Billy Crystal. It was a beautiful morning, with a crowd of photographers, media and special guest of Billy Crystal in attendance. 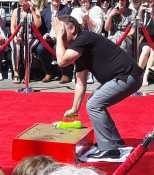 The cement was poured in a special box around 10 a.m. in preparation for the 10:30 festivities. First up was Ben Mankiewicz to talk about Billy’s career as a great comedian, being a host and cast on Saturday Night Live, an actor, producer and director. Ben also spoke about Billy masterfully hosting the Oscars for nine times. Ben introduced Rob Reiner who was next up at the podium. 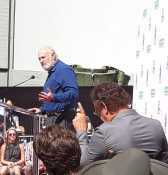 Rob Reiner said it was great to be there and that the man he was going to introduce he has known for 45 years. They have worked together, played baseball together and they complain to each other on the phone a lot. Rob told the story about Billy being cast to play his best friend on All In the Family and the rest was history. There were great words spoken about their friendship and Thursday night screening of When Harry Met Sally. Rob Reiner speaking about Billy Crystal, with Billy Crystal agreeing with him! Billy Crystal speaking about his wife Janet and producing two wonderful daughters together. After the introduction and speaches, it was time for Billy Crystal to get over to the cement before it started to dry and place his hands into the cement. Before that, one of his Grandson’s brought Grandpa a special foot made by Pixar for this celebration. It was Mike Wazowski, from Monsters, Inc.’s foot. How cool was that! His grandson was so excited to have that honor. What a wonderful hand & footprint ceremony it was. Enjoy all the photos below taken by The Hollywood Times. Billy Crytal as Mike Wazowski, covering one eye because Mike has one eye. HILARIOUS!